Not to be overlooked among the arbiters of Manhattan society in the 19th century was Nathalie Elizabeth Ray Baylies. While some women—Caroline Astor, Mamie Fish and Alice Vanderbilt, for example—were more apparent in the press; only a few claimed the pedigree of Mrs. N. E. Baylies. On November 27, 1856 she had married Edmund Lincoln Baylies, a graduate of Harvard University and wealthy merchant. The New York Times later wrote “With her marriage to Mr. Baylies two of the oldest families in America were united, the Baylies family having come from Worcestershire, England and settled in Massachusetts in 1737.” On Nathalie’s side, the Ray family included Cornelius Ray, President of the first United States bank in New York City. Among the couple’s ancestors were Colonel Hodijay Baylies, aide de camp to George Washington, and his wife Elizabeth Lincoln. “One branch produced President Abraham Lincoln and the other Levi Lincoln, the Massachusetts Revolutionary patriot, and his equally illustrious son, Governor Levi Lincoln of Massachusetts,” said The Times. Edmund Lincoln Baylies died in Geneva, Switzerland on November 28, 1869. The 32-year old widow pressed on, rearing the children and passing the summers more often at the Baylies estate, Kippanwoods, in Taunton, Massachusetts, than in Newport or other expected resorts. Like all moneyed families before and just following the Revolutionary War, the Rays had maintained a country estate north of the city. The 40-acre Ray Farm was near the village of Chelsea and its mansion sat approximately where Ninth Avenue and West 28th Street would be laid out. When the great house burned in the 1840s, Nathalie’s father rebuilt it; even though by now the city had closed in. Robert Ray died in 1879 and Nathalie not only inherited the Gothic Revival mansion, but moved in. Although the original house was a summer escape; this one was “built on the old-fashioned ideas of comfort,” according to The Sun. But despite the ballroom, the Gothic library with “room on the shelves for several thousand volumes" and its stained glass window, and the doorways that “rise to a point at the centre like cathedral arches,” Nathalie joined the northward movement of millionaires as the last decade of the century arrived. On Christmas Eve 1893 The Sun reported that the house was to be demolished. “Mrs. Baylies occupied the house until May last, when she decided to move up town, and she is now building a house at Fifth avenue and Seventy-first street,” reported the newspaper. The neighborhood was a hive of development. James Lenox had built his fabulous Lenox Library on his family’s “farm” in 1877 encompassing the entire block between 70th and 71st Streets on the Avenue. Following his death in 1880 the Lenox Hill land was sold off and mansions began lining the blocks. In February 1892 Nathalie Baylies purchased her large building plot from John N. Golding. She chose the newly-founded architectural firm of Boring, Tilton & Mellen to design the mansion. Edward Tilton and William A. Boring had formed their firm the previous year and by now Nathan C. Mellen had joined them. The Baylies residence would be among the firm’s few New York City commissions. In May 1892 plans were filed for a “five-story brick and stone dwelling.” The dwelling was originally estimated to cost $80,000—or about $2 million in today’s dollars. It would end up costing Nathalie Baylies much more not only in money and time, but in fury. The Baylies mansion would face the Lenox Library, taking the address No. 1 East 71st Street. Generally Renaissance Revival in style, the architects designed a 113-foot long structure, despite the building plot being just 100 feet long. 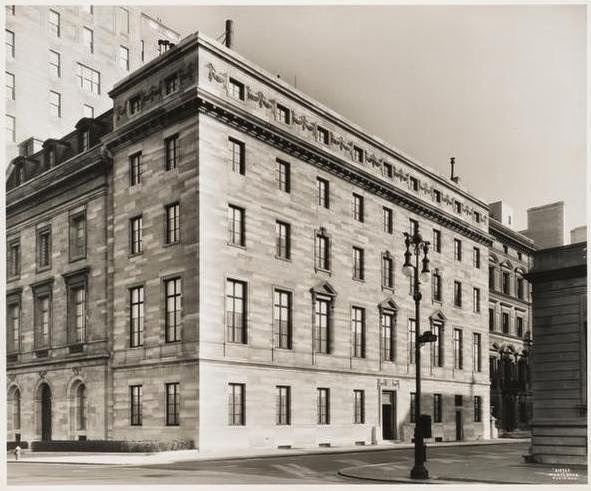 The extra length resulted from their adding dimension to the otherwise flat-faced palazzo in the form of three bulging bays—two on East 71st Street and one on the Avenue elevation. The bays extended beyond the actual property line. The “adjoining avenue owner” was Mrs Thomas E. Sattherthwaite. And, indeed, she did give trouble. In fact, she obstinately refused; despite the fact that her property was a vacant lot. The problem for Nathalie Baylies was that construction of her mansion was already well under way. Now, because of her objections, the Park Commissioners were forced to withdraw the permit for the Avenue bay. One can only imagine the infuriated pearl-swagged Nathalie Baylies as the drama played out. “The removal of the swell front would necessitate some change of plans,” noted The Times, “the destruction of some costly work, and rebuilding.” And that is exactly what finally happened. Although the bowed three-story limestone base remained, it had to be pulled back from the sidewalk; significantly reducing the interior square footage. 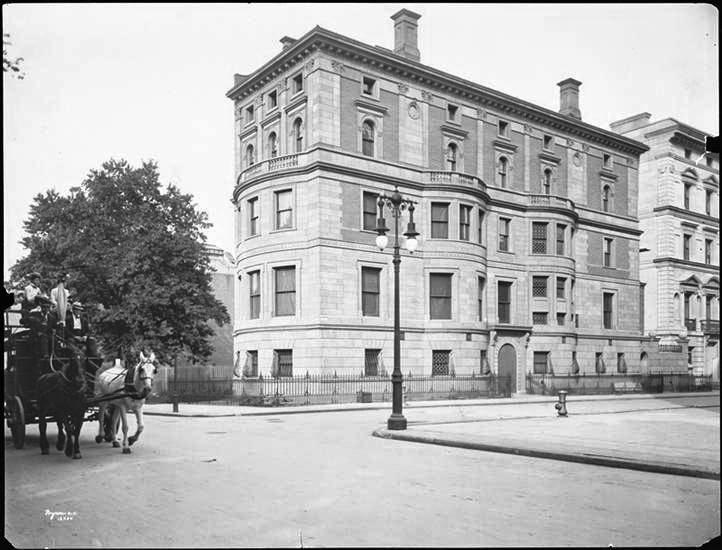 Nathalie Baylies anticipated a new neighbor in February 1912 when Cornelius Vanderbilt announced his plans to build a new mansion on Fifth Avenue between 71st and 72nd Street. His would adjoin the sumptuous James A. Burden residence at the opposite corner from the Baylies mansion. That would leave only the lot next door--the one which had caused Nathalie so much trouble--still undeveloped. By now steel tycoon Henry C. Frick had purchased the entire blockfront where the Lenox Library stood, anticipating the erection of a gargantuan mansion. 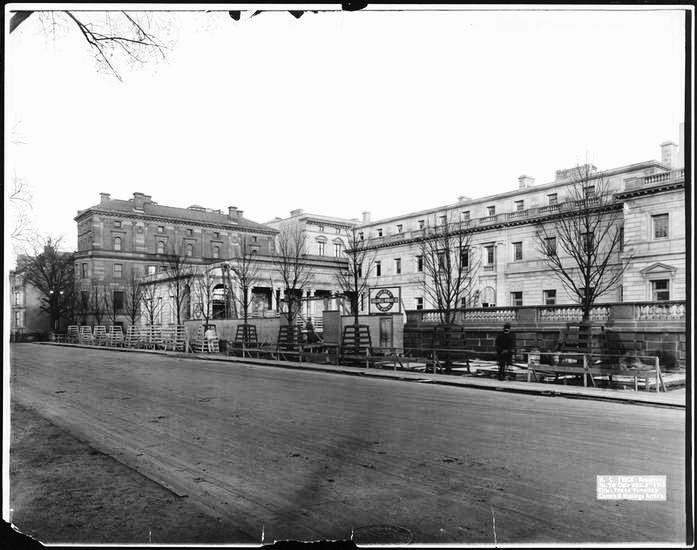 Nathalie Baylies, however, would not see the completion of either Vanderbilt’s nor Frick’s new homes. On December 9, 1912 the 75-year old socialite died of heart disease. The grand home she had built less than two decades earlier would not stand many years longer. It was replaced in 1928 by the equally-impressive mansion of Florence Vanderbilt Twombly, granddaughter of Cornelius Vanderbilt and the widow of Hamilton McKown Twombly. 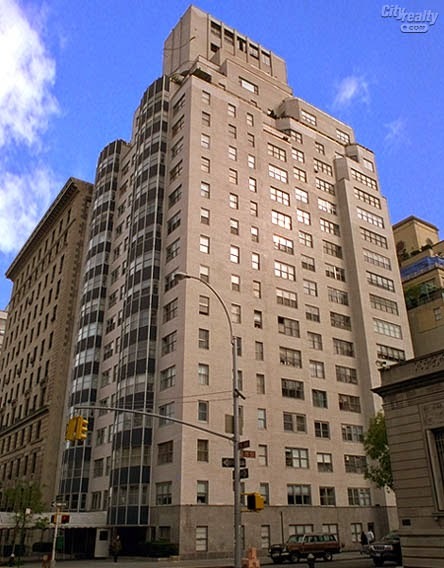 Following Mrs. Twombly’s death in that house in April, 1952, a modern apartment building was constructed on the site. She was a distant relative of my daughter.